Freely sharing and facilitating community knowledge is part of my DNA as it for many colleagues in the nonprofit technology field. Over the years, I’ve participated in and started many nptech online sandboxes, small online learning cohorts and wiki projects to explore best practices in nonprofit technology hosted on many different platforms and in collaboration with many different organizations. I’m passionate about the power of peer learning communities – and how we can all lift up each by sharing our knowledge with one another. There is an added benefit to learning communities. 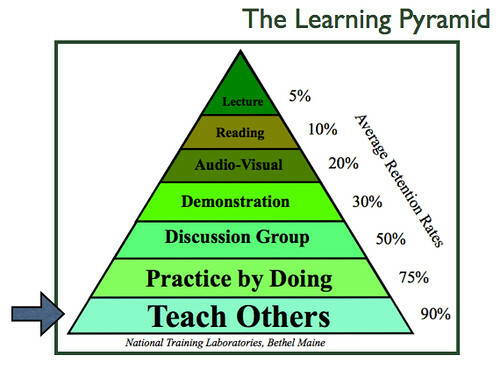 The Learning Pyramid or the Cone of Learning are well-known frameworks to trainers and while not based on research, anyone who has had to design and lead training or answer students questions – knows that the best form of learning retention is teaching others. If you combine that with a discussion group and practice by doing – learning soars. This is why I’m passionate about creating, facilitating, and participating in peer learning communities in the nonprofit technology field. They help deepen a field of practice. Back in 1993, I first started working with nonprofits and the Internet as the Network Builder for ArtsWire, an online peer community of artists. I didn’t know a modem from a microwave, but I was responsible for providing technical support to over 1000 artists who were first getting online or building web pages. The way I learned was through working with peer group of people who were supporting nonprofits in their quest to build capacity and skills using the Internet to realize their missions. In those days, we used listservs and online discussion software, but platform matter. It was the free and open sharing of knowledge, insights, quick tips, and how-tos. I then modeled this support on the online community — and we quickly had a village of practitioners supporting one of another. So, I invite you to join us on my Facebook page. Pull up chair, fill up that coffee cup, and join the discussion. Yes! Smart move on using Facebook as this virtual public square, as it is the perfect setting. So excited to start. Beth, it’d be great if you could occasionally let your readers know about Socialbrite.org, which offers more resources to nonprofits on how to use social tools than either Netsquared or TechSoup (terrific as they are). Hundreds of up-to-date articles, tutorials, interviews and how-tos, all free, all under Creative Commons licenses. Thanks, good luck with Zoetica & the Salon! Great idea about the monthly themes. Oh, I love this post. So glad you pointed out the dramatic benefits of peer-to-peer learning and teaching others. This relates to the topic Amy Sample Ward and I hope to present at the National Conference on Volunteering and Service. We pitched our session as Maximizing Impact with Online Communities, and it will be specifically about communities of practice and learning communities, not so much communities for causes as Amy did last year. The fact that you are doing this experiment on Facebook is very interesting. I don’t think of that as my favorite place to refer to for stored knowledge, but it is a great place for no-friction engagement, and permalinks are available. Look forward to hearing your assessment of the benefits and challenges of it as a learning community platform. Daniel: The Salon is taking place on the wall of the Facebook Page – http://www.facebook.com/beth.kanter.blog – join in – post a question, answer a question, or start a new thread. @JD Lasica – do you have any specific links on Socialbrite.org on measurement? Would love for you to post them .. I’ll go take a look ..
Hi Beth, will try to post a roundup later this week. Meantime, I’ve rarely seen a serious discussion that lasts more than a few days on Facebook, so very intrigued to see how it unfolds there in the coming days and weeks. But it seemed like a no brainer to meet where they’re out and there was already an audience there asking questions and sharing insights .. why create yet another place? 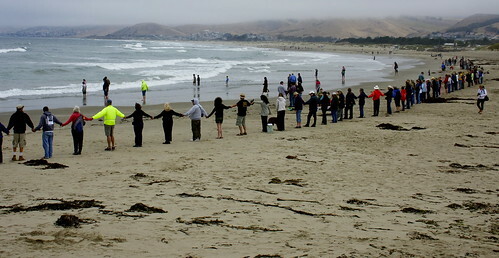 And, with some network weaving – and pointing to the work of others – we can embrace abundance .. Yes, embracing the abundance that is the success of Facebook! It has become a successful water cooler. I used to avoid it like the plague, but now that I know I can both connect with family *and* discuss nptech topics or see interesting resources and links …well, it’s starting to grow on me. … but now realize we need to do more, so digging in on some research and heading over to http://www.facebook.com/Beth.Kanter.Blog (though Facebook hasn’t let me post anything for past 2 hours). Looking forward to see what you come up with!! A how-to piece on conversion would be really useful! As a marketing person trying to revamp our nonprofits image, this comes as a welcome service! Thank you. this is a great resource, thanks. Can you do a monthly theme on Free Agents some next year? You started the ball rolling in your book, and it would be wonderful to share stories.